NaNoWriMo (the annoying acronym for National Novel Writing Month) ended two days ago. A week before the last day, I thought I could skid to the finish. I didn't. Thanksgiving punched a hole as big as a turkey dinner in my daily word count. Full disclosure: I stopped writing the Wednesday before turkey was served and never picked my novel back up again. Just 11,500 or so from winning. But is NaNoWriMo about winning? It's about writing, and writing isn't really about “winning” in the competitive sense. I wrote for 24 days straight, and each day I reached my word count. It wasn't easy for me. It pushed me to write more than I usually do in a day and to spend less time on making my sentences perfect. 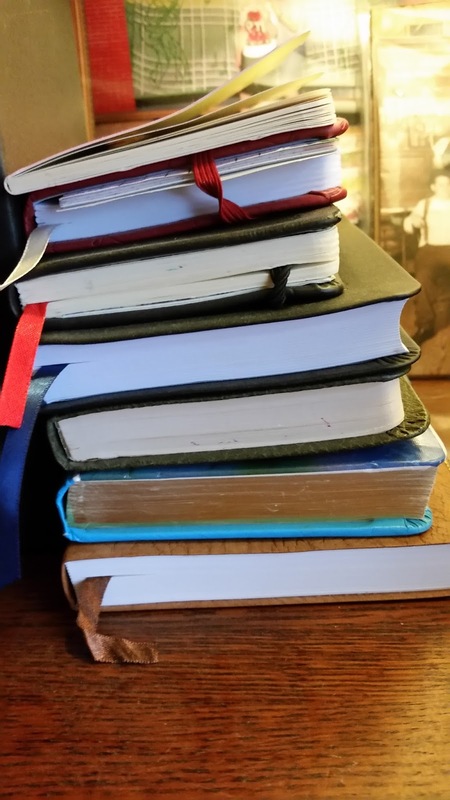 My process, so far in this noveling endeavor, has been to write as the ideas form in my mind, so my schedule might be every day or every third day. Sometimes, months go by between projects. Last month, I forced myself to write every day, including weekends, and move the story forward without looking back. I'm not unhappy with the product so far (vs. I am happy; I use the double-negative on purpose). I think my work is a good start, a structure. If anything, NaNo crystalized my conundrum. My writing habits have tended to evolve one way (a haphazard practice of writing when so moved), but the month showed me I could do it another way. It was harder, yet my work turned out relatively okay. Not everyone has the same experience. I asked a writing chat group what others felt about their NaNo novels, and one writer said: a pile full of crap (my words). Many writers think the idea of writing a 50K-word novel in a month produces ill-formed stories. In the throes of a bad moment or two, I could relate. Plotting has never been my weakness; selecting the words right has been. Admittedly, I wanted to run my book through a meat-grinder on a couple of nights. Or at least a chapter. A paragraph. A freakin' sentence. However, most of the time, I was jazzed. I dealt with household/work/parenting duties during the day, and slammed out a couple thousand words between 6-10p (usually longer). Easy? No. But a foundation went up in record time for me, and once the ending is written, the book will be okay. Not a Nobel. Not a Booker. But okay. Worth the extreme schedule. It felt extreme. Hyper-focused. A little more than neurotic. Brain-freeze-y. I ignored a lot of ordinary stuff and my pets more than usual. Piles formed. And, in a sigh of relief, I've spent the last few days focusing on the mundane. I haven't gone back to the book yet, and the guilt sets in. I've been made aware that I need to start writing every day. Probably not 2,000 words a day, because that felt a little taxing, but a couple of hours. I'm not going to toss out a grand judgment on the value of NaNoWriMo. A couple of my “buddies” (virtual writing friends on the site) exceeded their goals in handy fashion. A fellow friend from Texas wrote 100K before I'd landed on Day 24 with my paltry 38,500. I'll never be that guy, and I'm okay not being a word monster (cookie monster, maybe). I produce what I produce and keep going. Nothing I write is “wrong” – it is just written. Maybe someone will read it. Maybe not. The point of the exercise is to get into a routine. Allow yourself (myself) the time to do the work. It is work. The drafting, the editing, the rewriting, the proofing. It is a job. And if you want to make a living as a writer, you must do the work. Who am I trying to convince? You or me?